ALL ITEMS SHIP NEXT BUSINESS DAY! Write us an email, or send an email directly by clicking "Contact Us" below. If you think your product is not working correctly or you have a question on how to operate your product, we suggest you call our Customer Service Representative. Contact the Customer Service help line at: 1-800-777-5331 Monday-Friday from 7:30AM – 4:45PM Central Time or email custserv@spectraintl.com. Spectra and their Asia subsidiary, IMA-Hong Kong, LTD., have been an integral part of the consumer electronics business for the past 40 years. Spectra has supplied products to every major retailer in the United States, and has conducted business on every continent in the world. In addition to retailers, Spectra has been successful in the premium, direct mail and online channels of the industry. Over 15 years ago, Spectra formed a strategic partnership with Marino Andriani, LLC to provide Hello Kitty brand electronics and household products. The product line now includes Studebaker brand retro audio products and turntables, Karaoke Night brand machines, and others. What is the warranty on your products? How can I learn more? All of our products have a 90 day warranty from the original date of purchase. For information on our warranty, please visit https://www.spectraintl.com/index.php/support/warranty-information. I have one of your items that I no longer use and would like to recycle it, where can I bring it? We are committed to environmentally responsible business practices. For general recycling information and to find out more on how to recycle your product, please visit https://www.spectraintl.com/index.php/about/spectragrn. Do you have a customer service hotline? Yes. Call our Customer Service help line at: 1-800-777-5331 Monday – Friday from 7:30AM – 4:45PM Central Time or email custserv@spectraintl.com. I lost my owner's manual, how can I obtain a new one? You can download a copy of your owner’s manual any time from our site at https://www.spectraintl.com/index.php/support/user-manuals. If you think your product is not working correctly, we suggest you call our Customer Service Representative first before returning it. Often we can solve the problem over the phone. Contact the Customer Service help line at 1-800-777-5331 Monday – Friday from 7:30AM – 4:45PM Central Time or email custserv@spectraintl.com. California’s Proposition 65 entitles California customers to special warnings for certain products that contain chemicals above certain threshold levels. For more information go to https://www.p65warnings.ca.gov/. Why will my CD not play in my new boombox? CD mechanisms are designed to read all commercial CDs. It will also read self-compiled CD-R/CD-RW discs but it may take up to 10 seconds for the actual playback to begin. If playback does not start, it is likely due to the quality of the CD-R/CD-RW disc and/or the compatibility of the CD compilation software. The manufacturer is not responsible for the playback quality of CD-R/CD-RW discs. Can I replace the battery in the handbag lights? Yes. It requires 2 x 3V (CR2032) button cell batteries. SIGN UP AND CONNECT TO SPARKLEBEE! SparkleBee is dedicated to providing a user experience that can’t be beat. 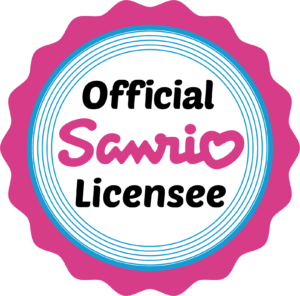 We are an official Hello Kitty® licensee and offer various Hello Kitty® products to consumers. © 2018 SparkleBee | Web Design by 76 Solutions.